Western blot analysis of HeLa cells stimulated with rhTNF-α (10 ng/ml for 5 minutes), using Phospho-IKKα/β (Ser176/180) (16A6) Rabbit mAb #2697 (upper) and IKKα Antibody #2682 (lower). Human Recombinant Protein expressed in E. coli. Recombinant human TNF-alpha (rhTNF-alpha) protein is expressed in E. coli, purified, and stored in PBS buffer containing 0.1% BSA. It is supplied as a 100 μg/ml solution and should be aliquoted and stored at -80ºC to avoid repeated freeze/thaw cycles. CST recommends using 10-100 ng/ml of rhTNF-alpha for stimulation of TNF-alpha signaling. rhTNF-α is supplied as a 100 μg/ml solution. It should be stored at -80°C. Aliquot the reagent upon receipt and avoid repeated freeze-thaw cycles. TNF-α, the prototypical member of the TNF protein superfamily, is a homotrimeric type-II membrane protein (1,2). Membrane-bound TNF-α is cleaved by the metalloprotease TACE/ADAM17 to generate a soluble homotrimer (2). Both membrane and soluble forms of TNF-α are biologically active. TNF-α is produced by a variety of immune cells including T cells, B cells, NK cells, and macrophages (1). Cellular response to TNF-α is mediated through interaction with receptors TNF-R1 and TNF-R2 and results in activation of pathways that favor both cell survival and apoptosis depending on the cell type and biological context. 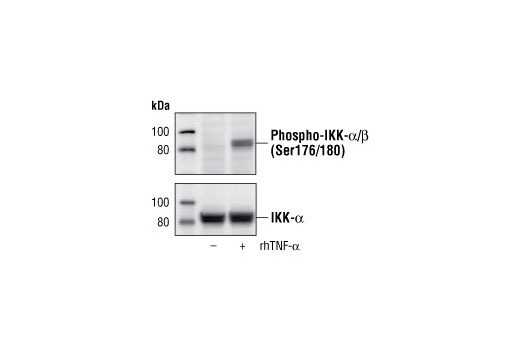 Activation of kinase pathways (including JNK, Erk1/2, p38 MAPK, and NF-κB) promotes the survival of cells, while TNF-α-mediated activation of caspase-8 leads to programmed cell death (1,2). TNF-α plays a key regulatory role in inflammation and host defense against bacterial infection, notably Mycobacterium tuberculosis (3). Aggarwal, B.B. (2003) Nat Rev Immunol 3, 745-56. Hehlgans, T. and Pfeffer, K. (2005) Immunology 115, 1-20. Lin, P.L. et al. (2007) J Investig Dermatol Symp Proc 12, 22-5.